Established in 1989, we have vast experience in manufacturing and installing PVCu windows, doors and conservatories. Despite the highly competitive home improvements market, our business has thrived over the years. We pride ourselves on providing a friendly and professional service coupled with products of an exceptionally high standard. Our triple glazed windows achieve an energy rating of A++21 and our double glazed windows A+12, making our windows extremely energy efficient. We firmly believe that customers should be able to price their own windows, which is why we openly advertise our prices on our website, radio and newspaper advertisements. We are also happy to visit you in your own home and show you how we work out the cost of your windows, something unique within our industry. This makes the process an enjoyable experience rather than being exposed to high pressure sales techniques adopted by some other Companies. Apex windows are an excellent company and their customer service is impeccable. The salesman Phil is superb and he’s got an excellent customer service and very professional. The fitters Kieran and his dad Martin are the best. They’re very tidy, very professional and good manners. They fitted eight windows and a front door. You cannot even see a mark anywhere. I will recommend them to anyone who wants to fit their windows through Apex to request for these two. You’re the best. We contacted Apex and two other well-known double glazing firms to obtain quotations for the replacement of all the windows and doors in our 3 bedroom house. The quality of the products demonstrated to us by Apex was impressive and their quote came in at under half of the one we had received from another very well-known Company in our area. Potential structural obstacles arising when installing the new windows and doors were identified by Apex in their initial survey and arrangements were made for the work to be done, included in the price. Whereas the other company hadn't bothered and this would definitely have caused problems and unexpected expense when the windows came to be fitted. The whole experience from choosing our quality windows and doors to the installation was a smooth and efficient process and their team of engineers worked hard to get the job done with the minimum of fuss or inconvenience to the customer. In fact, we were so pleased with the windows and doors, we placed and order for replacement fascia and gutter. Again, being reasonably priced this also, has really made a difference to the appearance of our house. These days, there are not many products or services that turn out exactly as the customer expects it to be, but Apex really delivered. We confidently recommend Apex for the standard of their workmanship and product. I contacted Apex windows after a new front door. From the first phonecall I could tell that I wasn’t going to be messed around which I had previously with another company. I explained my situation and everyone was really happy to help. I really wanted to show my appreciation to the two men that installed my new door and kindly removed the old door carefully to ensure I would get my refund from the other company. Thank you to Andy who was always at the end of the phone if needed. I would definitely recommend this company. We are over joyed with our new door it really is great and looks fantastic. It was certainly worth every penny thank you again. The Best Out There !! Apex Windows are amazing from start to finish with real honest advice and no salesman tactics, There fitters are brilliant and there polite and very tidy you will not have to do any decorating afterwards and most important there prices are good too it's very rare you find a honest company but I can honestly say Apex Windows is one of those companies. Hi Garry, Thank you very much for your excellent review. I'm very pleased you were happy with our service. Best regards, Andy. I had a new front door and 8 new windows fitted. It was really easy to get the quote, no double glazing sales or phoning around, just a straight up price. The guys that fitted the windows were very friendly and tidy - no decorating work needed to be done to cover anything up. Very impressed, we are so pleased. Thank you for your kind comments. We're happy that you were pleased enough to take the time to leave such a great review. I'll pass on your kind comments to the fitters. Many thanks. Kevin. We heard an advert for Apex Windows Ltd on heart radio station. They replaced all of our windows and put in french doors and sliding patio doors. We are very happy with the excellent work done. Very competitive prices. I would definitely recommend them, a great company to deal with. Thank you for your review and positive comments. We're glad you're happy you decided to use us and also that you were pleased with the service and the product. Many thanks. 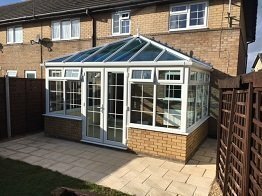 Apex Windows Ltd did a specially designed roof and fit our new conservatory. I got quotes from 3 different companies and with Apex Windows there was no pushy sales and they really knew their stuff. Their pricing was also very good and they stuck to it. They are honest and just did what they said they would. They always answer their phones and are always available to help. Thank you for your review. We're really pleased that you're happy with the work we carried out and it's great to see such nice comments. Particularly about the fact that we don't try to pressure people into placing an order with us. Thank you once again.